When shopping for a new refrigerator, there are considerations beyond style and visual appeal. In the sections below, we’ll explain the differences between side-by-side and bottom freezer fridges to help you make the best decision for your home. Choosing a refrigerator with a side-by-side freezer will give you lots of vertical space to store tall items in bottles or jars. However, a side-by-side doesn’t allow for storage of wider items, like casserole dishes, because of the narrow design. In addition, a side-by-side model may be ideal if you have limited space for the doors to swing open as they require less room. This model also provides freezer storage at a variety of heights. So, depending on how tall you are, you may have problems reaching items at the top. Alternatively, bottom freezers provide more horizontal space, which can be good for wider items like a pizza box or cookie sheet. Items can be stacked on top of one another, allowing you to store more than in a side-by-side model. While this is an advantage, it also means that you’ll spend more time looking for food at the bottom. You may forget you had an item or have to completely rearrange your freezer when searching for food. 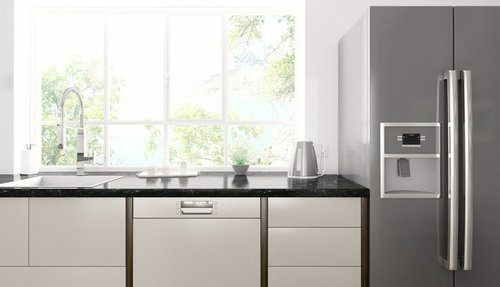 Bottom models are the best solution for smaller kitchens because they come in smaller sizes. Refrigerators of any size or model are heavy appliances that are difficult to move and position. Delivery and installation by professionals is likely your best choice to ensure that your home isn’t damaged and that it is configured properly. If you purchase a fridge with extra features, like in-door ice and water dispensing, it needs a dedicated water line. This is best done by a professional and may require additional plumbing. A side-by-side freezer is more cost effective, and you’re likely to get more features than with a more basic bottom model. A mid-range, side-by-side fridge between 22 and 24 cubic feet with an in-door water dispenser and ice maker will cost between $900 and $1,200. Delivery and installation costs vary but expect to pay around $150. This brings the total to $1,050 and $1,350. A bottom freezer is more expensive, and a mid-range refrigerator between 22 and 24 cubic feet without an in-door water dispenser and ice maker will cost between $1,200 and $1,700. Again, an installation fee of $150 brings the total to about $1,350 to $1,850. Many home appliance stores offer free delivery and haul away your old fridge. However, there may be recycling fees associated with the disposal of your old appliance. If you require a water line, a plumber will be required. These professionals charge between $45 and $65 an hour. Depending on the complexity, this work may take 2 or 3 hours. Refrigerators are one of the biggest consumers of energy in homes, so efficiency is an important consideration. Side-by-side fridges are less efficient because of the relative location of the freezer to the compressor. There is a larger vertical space that must be chilled, and the compressor has to work harder to keep air circulating and drawing out moisture. Conversely, bottom freezers are more efficient because the relative occupied space is more compact and less effort is required by the compressor. However, this is complicated in that the compressor is normally located near the bottom of the fridge, and it produces heat while in operation. Some heat will radiate into the freezer area, which means the compressor has to work harder to chill the space and keep it a consistent temperature. The most efficient option is to have the freezer on top. However, these are less popular with consumers because they have fewer high-end features and rarely come in large sizes. Another thing to consider is that an ice maker and water dispenser use more energy. If energy and cost savings are your primary concern, skip both of these options. Variable temperature settings are a feature that allows you to control the temperature zones in your fridge. Both side-by-side and bottom freezer refrigerators have a variable temperature control that can be adjusted manually. Some models have sensors that automatically adjust the temperature depending on the type of food. These, however, significantly increase the cost. Some bottom freezers provide a sliding drawer between the freezer and fridge compartments. This area offers flexibility in temperature control and can be used for keeping drinks or deli meat extra cold. Side-by-side refrigerators are best for kitchens that are narrow, and they take advantage of the vertical space. Bottom freezers optimize access to the fridge, keeping food at eye-level. Because freezers are used less often, this makes your everyday routine easier. If you have mobility issues or problems bending over, a bottom freezer may prove to be less convenient and not an ideal solution. Side-by-sides typically come with French-style doors. They’re available in a variety of finishes, including white, black, and stainless steel. These fridges can also be built into your kitchen and have exteriors that match your cabinetry. Bottom freezers are available in white, black, and stainless steel finishes and can also be built-in to match your cabinetry. There are limited models available. The freezer will either be a pull-out style drawer or have a single door that swings open. The appliance will have French doors or a single door that pulls open. In some higher-end models, there is an extra drawer between the fridge and freezer. These four-door models are increasingly popular because of the additional space they offer. Both side-by-side and bottom freezers can dispense water and ice through their door. However, only bottom freezer models with French doors offer this feature. The water and ice feature is available on higher-end models and requires a dedicated water line. Many consumers choose water and ice dispensing because of the convenience. How much does it cost to install a side-by-side or a bottom freezer refrigerator in my city? Cost to install a side-by-side or a bottom freezer refrigerator varies greatly by region (and even by zip code). To get free estimates from local contractors, please indicate yours.